Its no secret that I like my homemade waffles, I like the thick soft mallowy baked dough. I also like how the plain waffles are happy to take on other flavours and I don't mean drenching them in maple syrup, honey or flavoured sweet sauces, but enhancing them naturally with fresh fruit and vegetables. 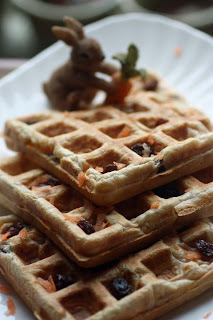 This Carrot Cake Waffle variation came to mind one morning, when all I had in my fruit come vegetable bowl were carrots. Well I do like my Carrot Cake and I've recently enjoyed some Carrot Curry, so why not put some carrots in waffles. 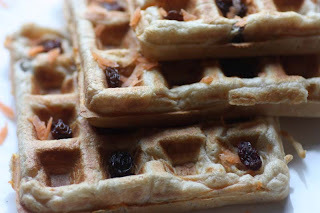 Like a good wholesome Carrot Cake, I ensured that my Carrot Waffles contained some essential ingredients such as: cinnamon, raisins and walnuts. The end result was excellent, but I have to confess these Carrot Waffles tasted nothing like Carrot Cake. The flavour was completely different. The Waffles were not overly sweet. The grated carrots had a pleasant chew almost like strawberry lace and the nutty walnuts had bite, but the real flavour came from the bursts of sweetness from the raisins. For me these soft bullets of raisins were the real star of the waffles. I was going to accompany these waffles with a rich butter cream as you would do a carrot cake, but decided against it as we have plenty of maple syrup and runny honey to squirt on top. In a bowl, mix the wet ingredients together and stir well. In another bowl, stir together the dry ingredients. Pour the wet ingredients into the dry and gently stir to combine. Then stir in the raisins, grated carrots and optional walnuts. Combine well. If the mixture is a little too thick, then add a little milk to loosen. Cook according to your waffle maker instructions. 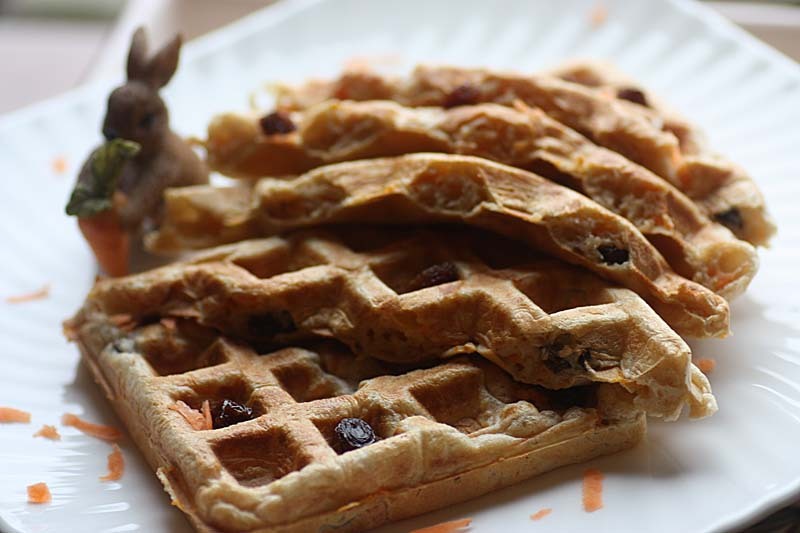 How cute is that little bunny with the carrot next to your carrot waffles?! Oh my this looks good. Have to send this to my daughters. Thanks. Great idea. I wonder if it would be good to caramelise the carrots fist since the waffle has a relatively short cooking time? Reading this post makes me want to make waffles again. By the way, I'm not a vegan anymore. Now I'm a vegetarian too! We don't have a waffle pan, but we make pancakes regularly..in fact..every Saturday. However, I have never thought of using carrots...and why not? I use them in latke's but you know, this is interesting and with raisins and walnuts..I've got to try it! Oh, made your roast butternut soup two nights ago, a la Thai...wonderful!! I love homemade waffles and make them about every other week for my kids (and obviously I have my fair share too!). This recipe is very inventive. The little bunny features quite a lot on my blog! I hope your daughters approve. Thank you so much Three-Cookies. I'm happy to eat carrots raw, so the little bit of raw chew in the waffles is fine with me, but if you wish you can caramelise the carrots fist - I'm just a bit lazy sometimes and do things for ease. Oh Mangocheeks, these sound wonderful. You are such a clever cook. I am drooling at the thought of tucking into them. You know I'd be happy to share with soem of these waffles with you. I'm sure the decision changing from your vegan diet back to a vegetarian one was a hard one, but you must do what is right for you. I do now and again consider a vegan diet, esp as many of my homemade main meals are accidentally vegan, but i don't think I'd be able to sustain a vegan diet in the long term, so I am happy with where i am right now. I admire your for your decision and honestly. I invested in a waffle iron about 3 years ago, and am so pleased I did. For some reason, I find it much easier than pancakes! 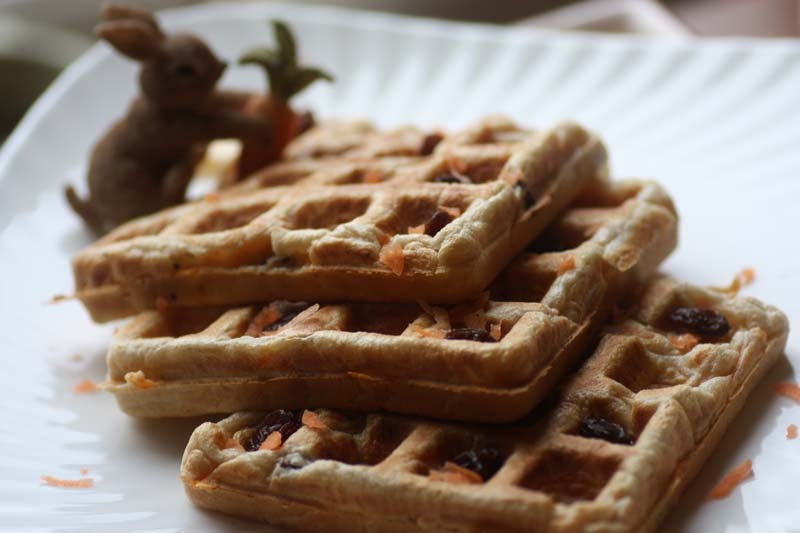 I'm so pleased you like the carrots in waffles/pancakes idea. You knwo what, I don't think I've ever made latkes, if I have I can't remember - so this gives me the excuse to have a go with latkes some day soon. :) So happy to read you made and liked the Thai Butternut - its one of my real favourites! Of course you have to have your fair share of waffles. Please Do give these a try. You are just too kind. You know i like to experiment, but there are day when I honestly just try and use what I have around in my home. These sound wonderful! I'll have to try as soon as things here are cleared up and back together. Sorry your weather's been foul. I hope it improves. I hope you do get to trying these. The roof work had started but it came to a halt beause of the rain. The roofers turned up this morning, so fingers crossed the work gets done before the thunder storms start.